Born March 22 in Mexico City. In 1934 he worked as a tailor apprentice in his father's workshop. At night he would study commercial printing at the important Academia de San Carlos and later on, with Carlos Alvarado Lang. 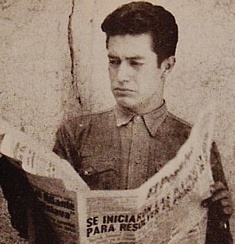 He was admitted at the Taller de Grafica Popular (TGP) in 1944. For this workshop he made numerous illustrations for syndic publications, periodicals and flyers for the campaigns run by the instituto indigenista. In 1948 he became a member of the TGP committee and in 1953 he co-founded the Salon de la Plastica Mexicana. He was also a founding member of the Academia de las Artes de Mexico in 1967. He was awarded the Premio Nacional del INBA in 1956 for his graphic art contributions and two years later, first place at the First Interamerican Biennale in Mexico. In 1958, after having been named president of the TGP, he attended the Peace Congress in Stockholm. He was also editor of magazines such as: "Ahi va el golpe" and "El Collote Emplumado" and a member of the board of editors at the "El Dia" newspaper. In 1960 he became the head of the Escuela Libre de Arte y Publicidad and in February of that same year he left the TGP. Between 1956 and 1966 he was head of the Art department at the Universidad Veracruzana. His work has been part of numerous exhibits throughout Mexico and abroad over the years. Alberto Beltran died on April 19th 2002 in Mexico City.